says "Kedarnath is an Indian Hindi-language film written and directed and co-produced by Abhishek Kapoor. It features Sushant Singh Rajput and Sara Ali Khan in the lead roles." to get instant updates about 'Kedarnath' on your MyPage. Meet other similar minded people. Its Free! kedarnath says "Kedarnath is an Indian Hindi-language film written and directed and co-produced by Abhishek Kapoor. It features Sushant Singh Rajput and Sara Ali Khan in the lead roles." 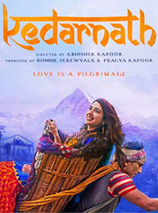 Kedarnath is a Indian Hindi-language film written and directed and co-produced by Abhishek Kapoor. It features Sushant Singh Rajput and Sara Ali Khan in the lead roles.